Disclaimer: The Lotoo PAW Gold Touch sent to us is a sample in exchange for our honest opinion. We thank the team at Lotoo for giving us this opportunity. 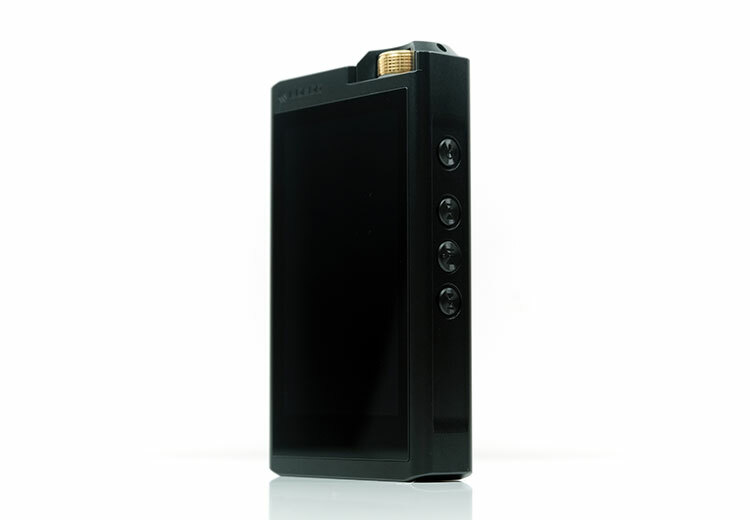 To read more about Lotoo products used on Headfonics click here. Note: This review was completed using FW version 1.1.1.0 released at the start of Feb 2019. 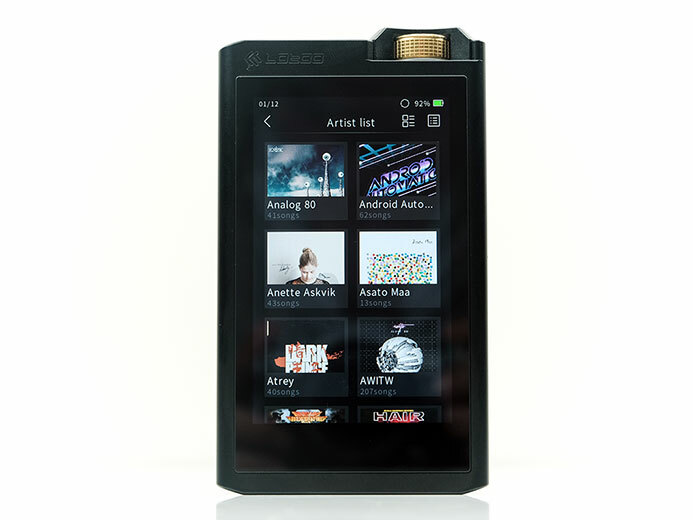 I am not sure Lotoo can ever be considered as mainstream as the likes of Sony or Astell & Kern. Up until recently, it was a brand for those “more in the know”. Kind of like that indie band you keep playing at parties knowing someone is going to shout out “who the heck is that?”. A guilty pleasure if you will. 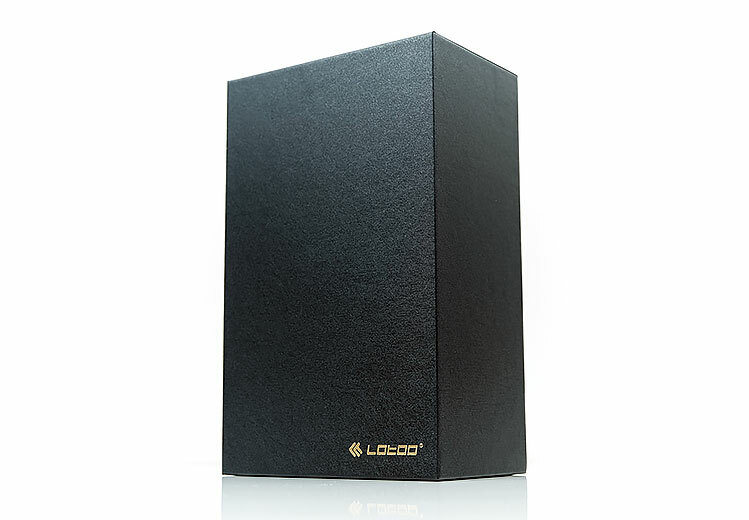 Lotoo’s legacy has been built primarily on the Pro recording side of the audio business with some solid and well-regarded audio recorders. It was from that side that the birth of the original PAW Gold came about in 2014. Cue the Indie band reference again because it was wonderful sounding if a little quirky and ‘pro-record’ish’ to use for all who owned it. Though not enough owned it compared to the likes of Sony, AK et al, it was, in every sense of the phrase, a flagship player of its time. Now in 2018/19 Lotoo are back with their new version of the PAW Gold called, the PAW Gold Touch and this could well be their ‘Joshua Tree’ moment. It retails for $3199, almost the same as the Cayin N8 and, in summary, quite the wonderful reference sounding flagship DAP. 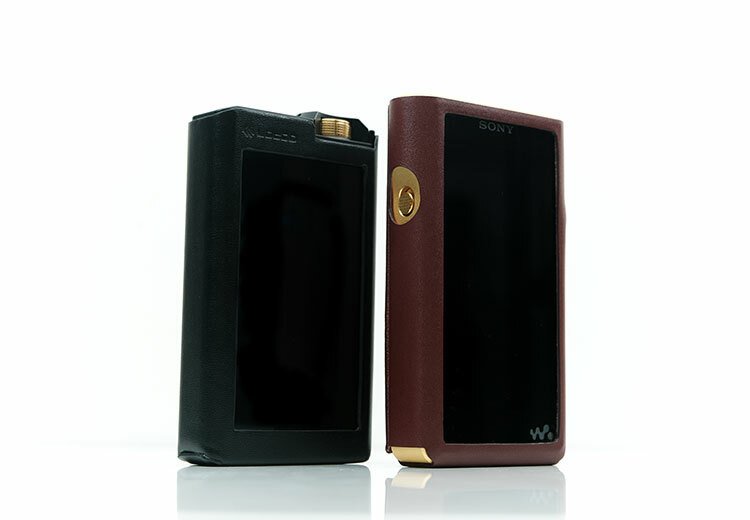 I think as early as now I want to point out that in some ways the PAW Gold Touch (LPGT from here on) is an evolution of sorts rather than a completely brand new DAP. It has plenty of new features and a new design but it also retains some aspects of the original PAW Gold and reimagined them into the LPGT. There is a definite continuity element for previous owners of the PAW Gold. Let us start with the obvious. The LPGT moves from the all-physical control set of the original to that of a capacitive touch-based digital media player. This is perhaps the most obvious physical feature and it allows Lotoo to change a number of things on the LPGT to bring it up to competitive par. Features such as a more discreet level of secondary physical controls, BT & WiFi, 4.4mm balanced, as well as a modern touch-based OS interface that most, if not all users, really demand in this day and age. This is a much deeper and more engaging experience than before. The touch interface now means a new OS and Lotoo are touting this one hard because of the software’s really in-depth sound tweaking capability and outright speed. This is not Android or HiBy, two of the more popular platforms for DAPs. This is their own fully-featured OS with a claimed boot-up time of just 2 seconds compared to Android’s 20-second plus alternative. That is fast! Roll-on 2019 and roll-in a modern flagship AKM DAC chipset, the AK4497EQ. This is the same TOTL DAC being used in both the AK SP1000 and the Cayin N8 with a PCM 768kHz and DSD512 decoding capability fully supported on the LPGT. That is even higher than the N8 and the SP1000’s own decoding limits (DSD256) on the same chipset. You could argue that Lotoo is pitching the LPGT as a long-term bet given those decoding standards. This is a beautifully designed DAP more reminiscent of some fine Japanese engineering than anything that could be classed as cobbled on the industrial back streets of Shenzhen. This is most definitely not a boutique or polarizing form factor. In some ways, it reminds me a little of some Sony styling with its contoured lines and minimalistic physical button interface to the right side. The aesthetic is dominated by the touchscreen with a reasonably small bezel. It is not HiBy Music R6 Pro small but satisfyingly discreet all the same. That matte black finish does help to minimize any bezel ugliness. I would certainly not want to see a silver version for that very same reason. It is also a very solid and robust DAP and slightly on the heavy side at 311g. Compare that to the N8 at 380g and the Sony 1Z at a mighty 454g then yes it one of the lighter flagships DAPs I have held in a while. 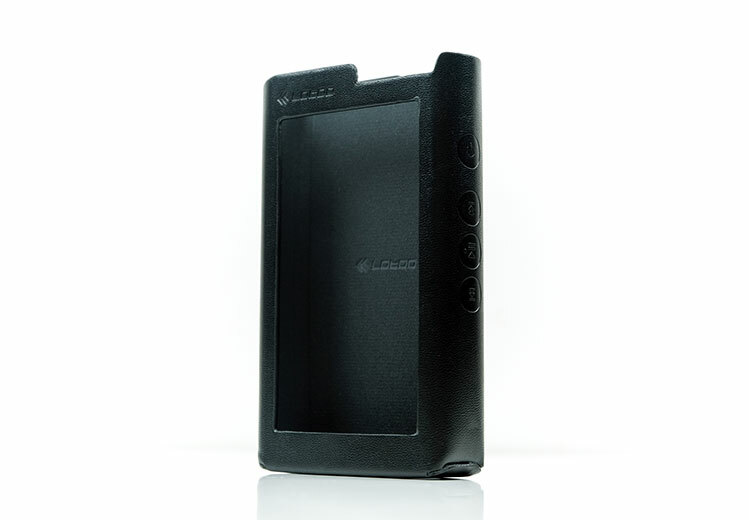 However, if you are upgrading from an iBasso DX200 (240g) or a FiiO X7ii (220g) you will feel that additional weight. A fair bit of that weight is in the material Lotoo have used with an aircraft-grade aluminum alloy chassis that feels quite thick with a solid rather than hollow sound when you tap on it. I also love how they retained that 24k “Apollo Sun” motif from the original PAW Gold command rocker and reimagined it into a similarly positioned top-mounted analog volume potentiometer. It creates a very nice contrast to the mostly black finish of the housing. It is especially eye-catching with its “breathing light’ ring just underneath that pulses during playback. You can switch that off, by the way, to save on battery life in the software environmental controls. The LPGT is deeper than long which makes it a good deal easier to work in one hand. It is just marginally shorter than the new HiBy Music R6 Pro but a lot shorter than the Sony 1Z and positively diminutive up against the Cayin N8. Of all the flagship DAPs it is one of the most compact players at 119mm x 68.6mm x 21mm. The most noteworthy dimension is the depth of the LPGT. Despite its compact form factor its much deeper than the SP1000 at 21mm compared t0 16.9mm of the AK flagship and the same depth as the volumetrically larger Cayin N8. 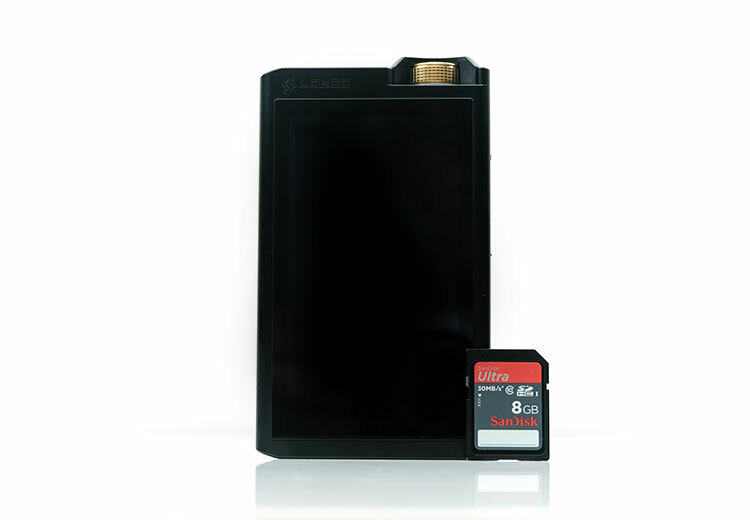 The LPGT uses a 3.77″ 400 x 800 IPS capacitive touch LCD panel with a fairly small bezel enclosure on the front panel. This is slightly smaller than the 4″ version on the Sony WM1Z though of slightly better quality than the TFT used by Sony. It is much smaller than the SP1000 screen also. Of course, the whole player design is more compact so there are physical limitations. For the size of the player the screen fits perfectly and commands attention. It is a much better fit than the smaller IPS 3.2″ on the even bigger N8 which had to compensate for the tube LED glow at the base. The color saturation and viewing angle of the screen is very good on the LPGT and certainly on par with the Sony WM1Z in terms of clarity. However, I find the brightness a shade muted compared to the N8 and Sony 1Z and its certainly not as vivid as the R6 Pro from HiBy. I suspect the max lighting on the screen is set a little lower than the others to enhance battery life. The protection Lotoo provide for the screen is excellent. This includes an Std 5 Cornering Gorilla Glass, an additional DLC layer which is a nanocomposite layer with diamond-like strength as well as a finger-print resistant coating on top. Further, Lotoo adds in a couple of tempered glass screen protectors if you should so prefer. Mine went on straight away. The first is the 3.77″ touchscreen where you can pretty much do everything except initiating volume control and turning the screen off. You can however increase or decrease volume control via the touchscreen once initiated via the physical dial. The only other function set excluded from the touchscreens command repertoire is the ability to power the LPGT on and off as well as turn the screen off. One nifty additional extra control is a double-tap to power the screen on. I had this on my LG G6 also and it is quite useful when the DAP is not in your hand or on a desktop. It is especially useful in USB-DAC mode when you are less likely to have it in your hand. You can activate or turn off this function in the main settings menu so it is entirely optional. The only thing missing is a home button of sorts. Lotoo instead requires you to swipe from the bottom up to navigate back to the home screen which is neat at first, slightly cumbersome after prolonged use. The second mode of control is via a standard set of physical playback and power on/off function buttons on the right panel similar to the Sony WM1z and HiBy R6 Pro. Volume control is via the analog rotary dial at the top which is heavily protected by a metal guard at the top. The analog rotary dial is very easy to use with a very smooth turn. It is click based with 1 step per click and very accurate at that. You will not find the clicks skipping more than 1 step. However, I do find the dial to be a touch less resistive than I would like to prevent accidental volume changes. It also has a very tiny bit of lateral movement but nothing significant. The playback buttons are fairly well raised which I prefer for operating out of sight. The power button has a bit more distance from the playback buttons and slightly smaller making it easy to distinguish which is which on touch only. The central button has a small and helpful protruding dimple to help you center your physical navigation. The final control is slightly indirect and that is via wireless, or to be more precise, the LPGT’s Bluetooth. This is a bi-directional 4.1 BT setup so you can master/slave with smartphones and other BT source receivers to transmit and receive audio. When connected you can control playback via the source transmitting device to the LPGT. The LPGT has three different analog outputs and one digital input. The analog side includes a 4.4mm/LO balanced and 3.5mm/LO unbalanced output on the top panel and a single USB-C digital input at the bottom. The two jack ports have dual functionality for both line-out and PO and you can choose between which in the output section of the main settings menu. I do wish Lotoo would throw in a selection warning you that are on LO just to prevent accidentally using headphones or IEMs on full-line out. I fell victim to that twice and it is not a weak line out I can assure you. The USB-C covers USB-DAC, data transfer and charging the LPGT. It will also allow you to OTG from your phone. What I like about the Touch’s digital audio during OTG or USB-DAC is the ability to tweak the sound with some sound shaping such as XRC, PMEQ, and ATE. 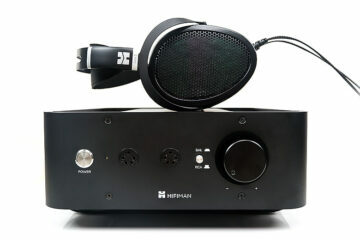 You can find out more about these filters in our main sound impressions on Page 3 of this review. The LPGT uses a full SD memory card solution, there is no onboard memory. Ah! This is a legacy throwback to the original Paw Gold which also used a full SD slot. That, in turn, is a nod to their voice recorder business which tends to use larger memory card solutions. I must say I am surprised there is no onboard memory for the Touch version. This seems like a missed opportunity that competing flagships have worked on such as the N8 at 128GB and the Sony WM1Z at 256GB. Luckily, I have plenty of SD cards lying around from my cameras but if you are worried about compatibility you should be able to use the accompanying SD card adapter for your microSD card without issue. The memory slot is slated to support up to 2TB so I presume this means SDXC support. The biggest developed card capacity right now is 1TB with 512TB commercially available in most outlets. I tend to work with 64GB cards on a ‘cost to failure’ ratio basis. One bonus if you have not noticed it from the picture yet is the ability for the LPGT to work with Ultra High Speed or UHS-II SD cards. Pretty smart move given the speed of the OS and the automatic scanning feature of the media manager. For the review, I used a SanDisk Extreme Pro 64GB UHS-II card and it is so much faster than working with microSD cards in adapters with almost no lag when changing tracks. Despite a fairly chunky 5500mAh Li-poly battery inside the Touch, the rated life-cycle is just ok at 10 hours. It is not Sony levels of 15-20+ hours but slightly edges ahead of the N8’s 8.5-9.5 hours from its huge 7000mAh battery. You can excuse the N8 a little with that Korg NuTube so I can only presume this is related to fairly hefty amp stage inside the Paw Gold and the slightly larger IPS screen. Lotoo does not mention the test conditions for the 10+ hours so I presume it is lossy decoding with the screen off or low brightness settings and not too much button mashing. I was closer to 9 hours with all my screen poking during our review period with FLAC and closer to 10 with lossy files so the numbers are pretty accurate. Expect those numbers to drop if you are upsampling using the XRC function, Bluetooth, or high-res decoding with the screen on. This is actually not a bad little retail presentation. I like the gold outer laminate covering and ties in well with the Apollo Sun volume dial theme on the unit itself. It is not on the Cayin N8 level of unboxing the awesome but it delivers more “wow” than the bland Sony 1Z box. Accessories are a little on the light but what you do get is good quality. Enclosed is a very nice stitched black leather slip-on case for the unit itself with the PAW branding on the rear. 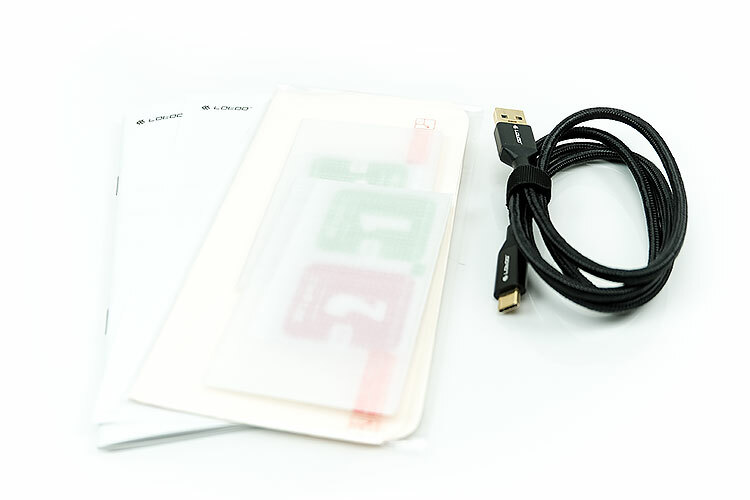 You also receive a single USB-C to USB-A cable for charging, USB-DAC and data transfer duties as well as 2 tempered glass screen protectors. Beyond that, you get your usual array of paper guides. Just one thing to mention about the otherwise high-quality leather case. When you put it on initially it is very tight but it will loosen up fairly quickly with repeated use. You may find that when you take it off the first few times that it simply will not budge and it is not easy to grip the top of the LPGT and just pull it out. Neither is it easy to just massage it out via your fingers and screen. What I did, though I am not wholly recommending it, was to poke the bottom plate via the USB hole at the bottom and push it far enough to grab it at the top and gently massage it out from there. A few more of those should loosen up the fitting to be able to just slide out the LPGT from the base of the screen. It would also be great if there was an SD card opening at the bottom of the case so I wouldn’t have to pull out the player when I want to change cards. This would save a lot of initial hassles with the case.